I shall be making lavender ice cream and elderflower cordial this week, and then it will be time for jam making with the strawberry fields already open here… a busy month! What’s on your agenda for early June? Thank you Arthur – June is a lovely month isn’t it! Such a change in your view just over the last few weeks – now it’s overflowing with colour! The elderflowers are starting to open here, so it won’t be too long before we’re making cordial. 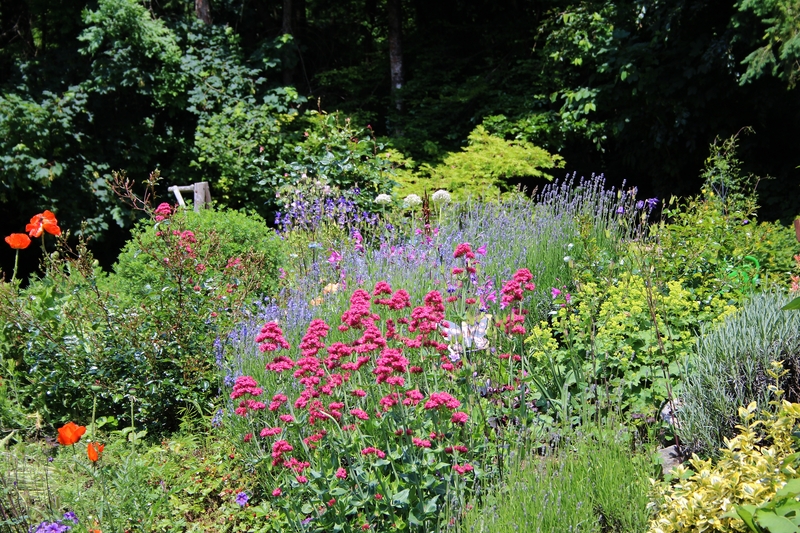 The view certainly benefits from the Centranthus… I have to pull out so much or it’d take over, but the insects adore it! Your garden is looking beautiful with lots to enjoy. I love your header. It really sums up June. I made my elderflower cordial today. The flowers are over so quickly that you can’ t hang about, I missed them last year. Thank you Chloris. The pink peony in the header is fading rapidly! 😦 We’re lucky and have our own elder trees in part shade, so that prolongs the flowers. I think I can wait until the weather is drier at the weekend. 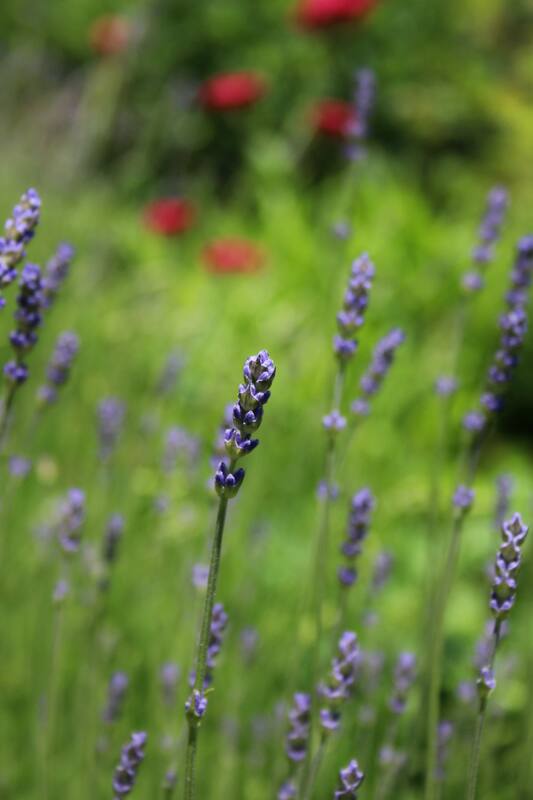 Your lavender is beautiful, doesn’t it smell lovely… I’m very busy with the weeds at the moment. They don’t seem to end!!!! Such gorgeous, colourful pics, your garden looks wonderful. My lavender is just starting to flower and I do like the idea of making ice cream with it, yummy. Lavender ice cream always signalises the start of summer for me… I made some today so it will be ready for our heatwave at the weekend! 😉 Thanks Andrea! Lovely summer view, lavender ice-cream sounds interesting, looking forward to your recipe. Thank you, I send your recipes on to my daughter, she is a student food blogger, I know she will love this one. 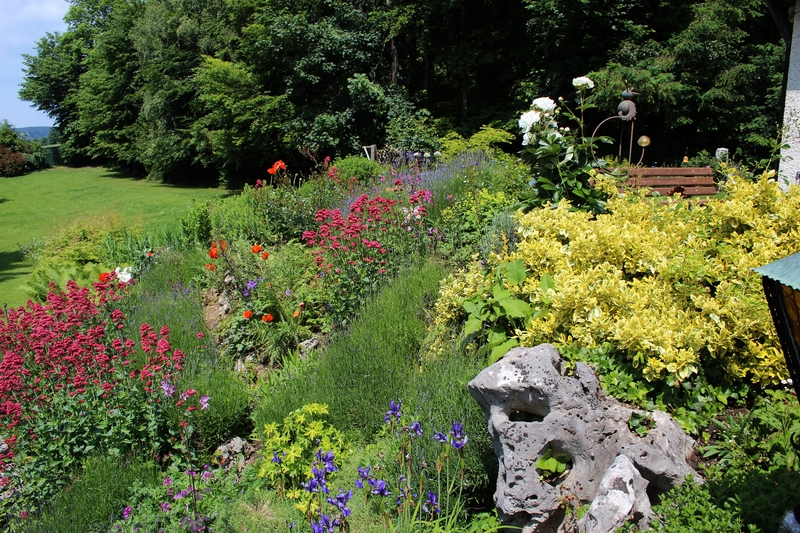 From looking at peoples blogs it’s amazing to see how quickly English and European gardens seem to have arrived at summer this year – yours is a lovely example. I’ve been enjoying your ‘view’ shots for a while and this is certainly a lovely time. We had a mild winter and a very pleasant spring, and compared with the last two years we are about 3 weeks ahead. It seems the opposite is the case in America, being several weeks behind ‘normal’, making the difference seem even greater! Thank you for commenting! These photos are absolutely stunning! What beautiful flower beds! This was the highlight of my morning! Thank you! Lavender ice cream is my favourite, but I’m the only one who likes it in our house, which means I get to eat it all by myself! 😉 I make one batch and make it last a couple of weeks…. well a week anyway! Wow! summer has arrived in Germany! My roses are beginning to finish now but my lavender isn’t flowering at all yet – so wierd that one plant is way ahead and others behind. I’ve already made strawberry sorbet from my first strawberries and elderflower sorbet too, you should try that, you’d love it. I think I posted the recipe, I’ll check and if not I’ll post it this week. Elderflower sorbet sounds wonderful and I would love the recipe… I made elderflower pancakes and my syrup today and the flowers are infusing now. The smell in our garden from the flowers above us in the woods was almost overpowering! Isn’t that odd – roses and lavender flower together here… is that normal that the lavender is so late? I’ll email you the recipe, sorry I meant to send it yesterday. I need to check about when the lavender flowers, I think the lavender usually flowers in June, maybe I pruned it later this spring, but I don’t think so. I suppose the south-west position of my lavender means it flowers earlier, but it is 2 or 3 weeks ahead of normal. I haven’t tried growing arum lilies Amelia… I always assumed they are house plants. Are they pretty hardy? They are very hardy. If it freezes they look like what lettuce would look like if you tried to freeze it but that is only above ground. The corm/tuber is very tough and shoots up in late spring. I’ll have to try then. Thanks! Your slope has certainly burst into flower, it all looks so summery! Lavender ice cream sounds delicious! I think lavender ice cream is a love it or hate it thing… I get to eat it all to myself! 😉 I actually took some time to look at the garden today without working in it…well, nearly… and it really is summery! Beautiful! Do share your recipes, lavender icecream sounds interesting.D. Yum! I will wait for your update . Packing up house to move. Garden too! D.
Oh, good luck with the move! Thanks. Taking the mini greenhouse down tomorrow. Yikes! Cathy, you’ve created a summery, magical place. This is really wonderful. My lavender is just about to open. I’ve already had your lavender ice cream in mind! I made mine today Susie. The smell really is ‘summer’! hope you enjoy yours too! I would like to visit some more gardens that I have never seen: Palmisano Park, the Bahai Temple, and Morton Arboretum. Also, I hope to go to the Italian food festival they have in the western suburbs in July. Great for inspiration Jason. Hope you can post about some of those gardens if you get the chance to go! I’m leading a garden tour in Italy. Today we visited Isolla Bella on Lake Maggiore; tomorrow we go to Florence. La dolce vita! Oh it definitely looks like summer in your neck of the woods Cathy. The elders are frothy white here. I’m hoping that they can hold on a tad longer until my goosegogs are ready for picking as I would like to combine them in a jam. I have heard gooseberries and elderflower go well together, but we so rarely see the fruit in shops or even on the markets here… perhaps they are just not in fashion here. One day I’ll try it though! All the bloom times are very mixed up here this year – our lilacs are just barely getting started and the roses may not bloom this month as they usually do. This morning, there was snow west of us and in the northern part of the province – it’s been such a crazy year. I’m hoping to get out to a u-pick and get some strawberries, but that may not be until next month. Even the rhubarb is late! That really is crazy. Maybe you’ll have an extra long summer and autumn to make up for the long winter…. 😉 Hope those strawberries ripen quickly! Cathy how gorgeous the garden is…my lavender is limping along and roses are growing from their bases, much shorter by half this year if they are growing at all…but the peonies are stunning and about to open. At least the peonies can be relied on Donna. Hope to see a few photos!